Your mate sits patiently. You put some food lovingly in your dog's bowl. You place the bowl gently on the floor. You give your dog the cue to come and get it. WHOOOOOOOSH! Your dog is there in an instant flat. GOBBLE, goBBLE, GObble, gobble, goBBle, swallowing chunks almost too large to swallow, gobble GobBle, FINISHED! Did your dog even taste that food on the way down? Who knows? But it's all over red rover. 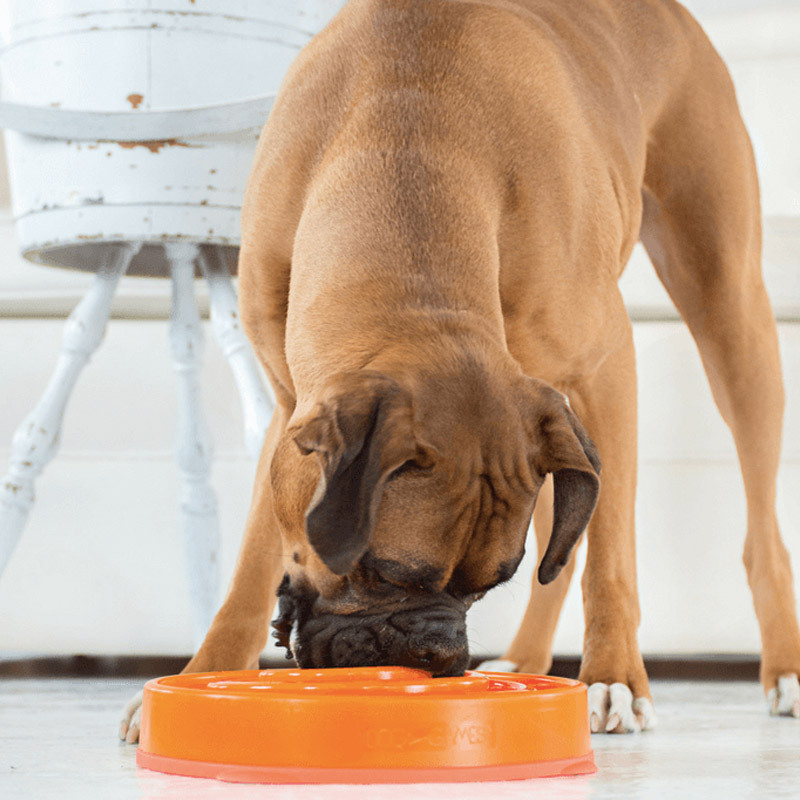 It's nice to see your dog eat with gusto but there are a number of reasons breakneck speed isn't the best idea. Eating like a vacuum cleaner can lead to digestive issues. First of all your mate could choke. This is always a danger with food gulping. Dogs will also inadvertently swallow air as well as food and this can cause your dog to vomit or gegurgitate. Excess air accumulates in the stomach and when the food and air expand there this can cause massive discomfort. What dog owner has not been scared by the possiblity of bloat? This is that crazy condition where a dog's stomach fills with gas or food or fluid and gets distorted to a point of twisting or turning in the body and causing blood to get trapped in the stomach. It comes on quickly, is often not picked up on until it's too late. And it can definitely be fatal. Seriously, if your dog ever has a swollen stomach get to the vet immediately. Bloat is not fully understood but eating quickly has been indicated as a definite trigger. 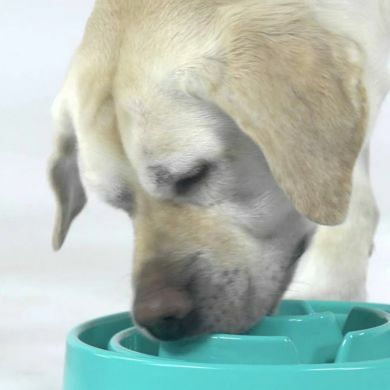 Wolfing down meals stops your dog from feeling full when eating. I could pretend that I've never wolfed down a meal but I do often feel like I'm part canine in any case. I bet you are too. In any case, eating at light speed makes you more likely to overeat and want more food. There's notIf your dog is needs to lose some weight it's definitely worth giving the Slow Feeders a try. enough time for the feeling of fullness to set in when you eat fast. And there you are already on a second plate full. Your dog experiences this too. Eating slower gives your body a chance to notice that you've eaten. I'm not saying your dog will politely refuse more food upon eating slower. However, the chances are your mate will enjoy the food more and not feel as hungry immediately afterwards. Dog obesity has got to be one of the biggest problems dogs face in Australia. A dog is classified as obese if you cannot easily feel their ribs with your hand. This area on your dog should have minimal fat covering. You should be able to look down at your dog's shap and see your dog's waist from above. Also, your dog's chest should definitely be wider than the adbomen. If not there's a good chance that your mate is overweight. I have two of these for 2 smallish dogs. 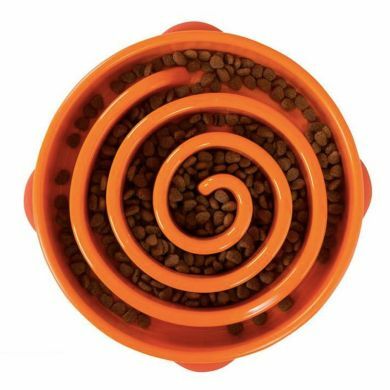 They have been used only once; this morning for dry food with some added Greek yogurt. It certainly slowed them down to around 12 minutes instead of 30 to 60 seconds. The short tongue of the smaller dog was just a touch problematic; but he seemed happy enough with the end result.The quality of the items is excellent. Strong, sturdy and non slip. Easy to clean with a cloth or a brush with long bristles and, very quickly dry without the use of a towel. 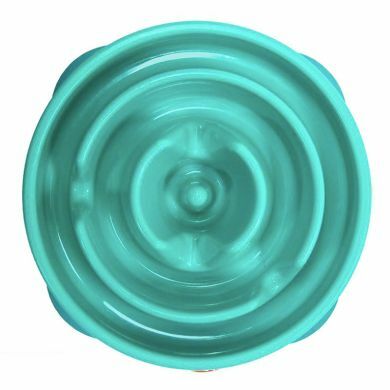 The bowl itself is really solid, made of heavy plastic, very sturdy and able to withstand my dog's attempts to turn it over. It has done the job exactly as I'd hoped - instead of a meal being wolfed down in 5 seconds, she is now taking a good 5 minutes, at least. Read 3 customer reviews of Outward Hound Slow Feeder. The average customer rating is 5. Your service is great and much appreciated. The fast delivery is unbelievable. Thank you . You do good work. The look on her face when she was first presented with her new bowl was worth a thousand words - she could not believe she was going to have to work so hard for her food! 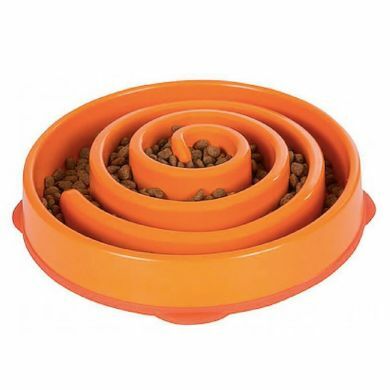 Great well made product, really works to slow down my Labrador’s eating.